Surveillance cameras are becoming a necessity almost among all the residents around the globe. People are not interested in compromising with their safety especially at home and offices. And capable cameras possessing all sorts of upgraded features are something every person needs. When it comes to installing a surveillance camera somewhere the main issue that arises for its maintenance is the amount of electricity it consumes. It is undeniable that a camera working 24/7 requires a lot of electricity to maintain its working procedures. But to ease this problem, there are solar dependent cameras out there which consume solar energy mainly to work 24/7. 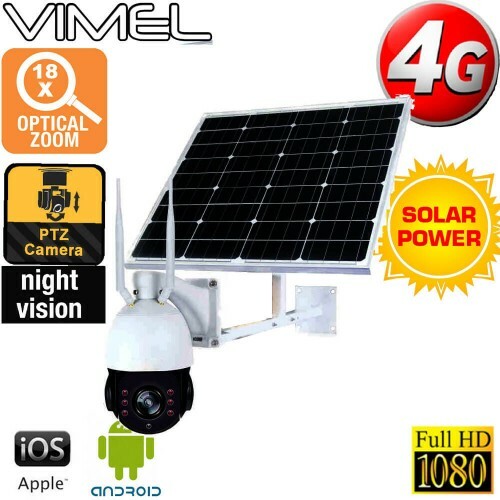 The Vimel IP camera is perfect for security purposes also possessing the efficiency of not consuming electricity and working on solar energy. This camera comes with a single solar panel attached to it which takes care of all the necessary operations for the device to function smoothly. Not only the solar panel, but it also comes with a battery which maintains the performance of the concerned product. This is a sim card operated camera and can record up to 60 meters at night which makes it highly adaptable for practical security purposes. This sim card camera also can zoom up to 18X and comes with a 4.7-84.6 mm lens. This camera can connect to Wi-Fi and enables the user to watch live streaming video on a PC or on their mobile devices. Also, it possesses a micro SD card and can support a 12 GB card as well. This camera comes with a solar kit which makes it entirely hassle-free to install and operate. The solar kit consists of solar panel, controller, battery as well as a mount.